Isabelle Legeron, the first French female master of wine, travel channel presenter and founder of RAW the artisan wine fair, has launched her own natural wine, Lagvini. 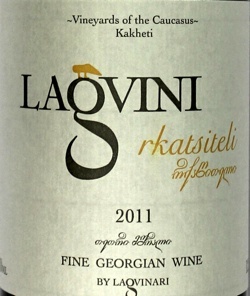 Lagvini is the product of a joint venture between Isabelle and Eko Glonti, who met and became close friends while filming for Isabelle's show, ‘That crazy French woman in Georgia' for the travel channel and decided to go into business together, to produce Georgian fine wine. Lagvini is a natural, orange wine, fermented and aged in a kvevri - traditional, Georgian clay pots buried deep underground – an ancient winemaking method dating from 6000 BC. The wine is made from organic Rkatsiteli grapes grown in Kakheti, eastern Georgia, in the foothills of the Caucasus. The winery works with local, artisan grape growers, using indigenous grape varieties and ancient winemaking techniques, to promote sustainable Georgian farming and preserve its cultural heritage. Isabelle says: "We are extremely proud of our first vintage. Our fun experiment has yielded a grand total of 1,000 bottles, a portion of which recently arrived in the UK. We want to push the current production status quo in Georgia with the aim of producing the finest wine possible in this extraordinary country!" Lagvini is listed in a number of top London restaurants including Pollen Street Social, Tom Aikens, The Zetter Hotel, Sketch, Antidote, Hibiscus and Elliot's. It will be one of the wines on offer at RAW the artisan wine fair, which takes place 19-20 May at the Old Truman Brewery, London. Isabelle Legeron is an award-winning wine taster who stands for authenticity of taste and fine natural wine (free of additives and manipulation). She is 'that crazy French woman', consults for London Borough Market's Elliot's, as well as Hibiscus, a two star Michelin restaurant in London's Mayfair and the eco-luxury Soneva Fushi resort in the Maldives.